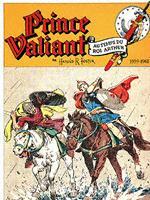 Prince Valiant, Prinz Eisenherz. The official website! Zenda did start with this publication. They printed 17 volumes in color. Strange enough they started the serie with the sunday pages of 1947. After Zenda, Glenat did reprint the whole serie. Several prints are made and this is the most common serie in France on the moment. The different prints do have the same covers, except for small details as numbers, annual years, titles or not etc. Format of the books is 23 cm x 32 cm. It's not clear for me how much different prints there are. Could anybody help? Zenda & Glenat did print the whole serie between 1987-97.